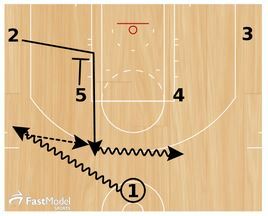 These two plays to set up your three point shooters came from the FastModel Sports Basketball Plays and Drills Library. 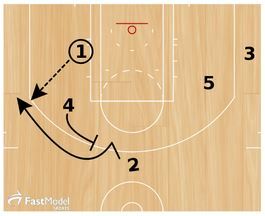 The first play is used by the Hawks and the Celtics. The second set is used by the Trail Blazers. 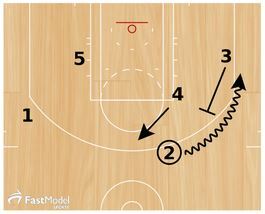 2 cuts to the block, then back up the lane of the screen from 5 to the NBA slot. 1 makes an Iverson cut off screens from 4 and 5. 3 clears to the opposite side. 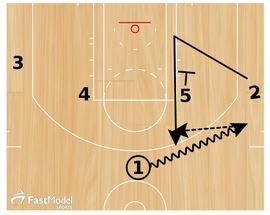 4 turns and sets a side ball screen for 1. 1 rejects the ball screen and drives. 4 then sets a third screen for 2. 1 throws back to 2 for the 3 point shot. 2 comes off of 5’s zipper screen. 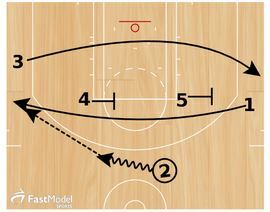 3 sets a step up screen for 2 while 4 steps to the top of the key. 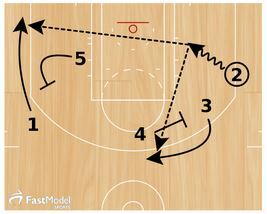 5 sets hammer screen for 1. 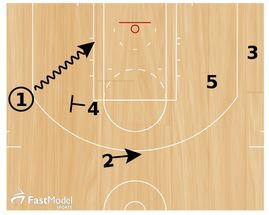 2 has two options for a pass for a three point shot.